Nothing makes guests feel more welcome than a comfortable bedroom and a brand new bathroom outfitted with all the little things a guest could possibly need. What’s more, a new bathroom can be designed to match other updates in your home, which can help increase your home’s resale value. 1. Towels. Put out some fresh new fluffy towels for your guests to use. Make sure to also put out some nice bath mats as well, to keep feet off cold tile or damp flooring. Hang up a matching shower curtain and set out a hamper for guests to throw their damp towels into after use. 2. Toiletries. A new bathroom that’s adequately stocked with facial tissues, cotton balls and swabs, toothpaste and other conveniences is sure to make any guest feel pampered. Set out some nice-smelling hand soaps, bath salts, and a loofah or a couple of bath brushes for an extra touch of luxury. 3. Medicine. Illness can ruin your guests’ enjoyment of your home during the holidays, so keep some medicine handy in case the need arises. Provide your guests with bandaids, disinfectant and medicines like aspirin, antihistamine and heartburn pills by placing them where they can easily be found in your new bathroom. 4. Scent touches. Scented candles can be great for making your home feel inviting. Alternatively, use a plug-in air freshener, essential oil burner or reed diffusers to keep the bathroom smelling its best. 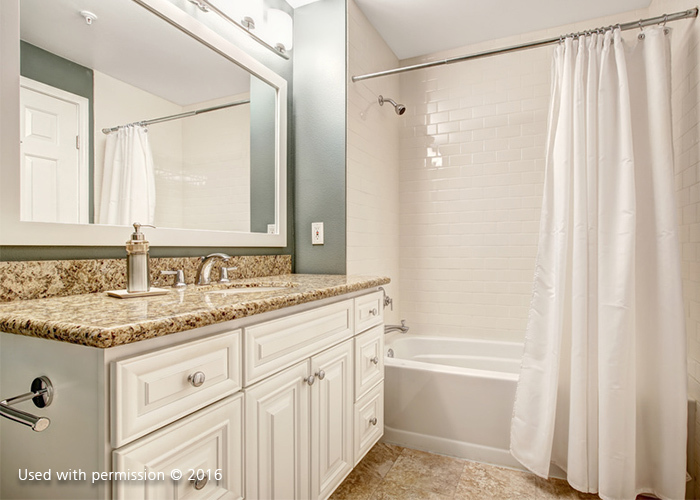 Look no further than DreamMaker Bath & Kitchen of Union Grove for a quality bathroom remodel. Call us today at (262) 923-8721 or fill out our convenient online form to schedule your consultation, and make this holiday season your merriest ever!